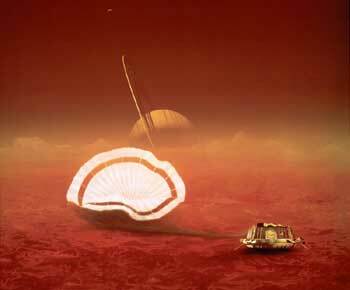 Huygens probe is now on the surface of Titan - Solar System Planets And Moons Section. Huygens probe is now on the surface of Titan. European Space Agency's Huygens probe is now on the surface of Titan. Huygens probe Lands on Titan. Keck Observatory in Hawaii View of the Water Fountain Nebula. The powerful W. M. Keck Observatory in Hawaii took this image of a dying star nicknamed the "Water Fountain Nebula". This nebula is 6500 light-years away in the direction of the constellation Scorpius, and was imaged at near-infrared wavelengths. The double corkscrew structure of the nebula indicates that there's probably a rapidly spinning remnant at the centre which is blasting out twin jets of material. By taking photos of the nebula again in a few years, Astronomers will be able to understand how nebulas like this evolve over time. Galaxy Has Leftover Material from the Big Bang. A researcher from Indiana University Bloomington has discovered what could be primordial hydrogen, unchanged since the Big Bang. This Hydrogen was found in Galaxy UGC 5288, located 16 million light years away from Earth. When studied with the National Science Foundation's Very Large Array radio telescope in New Mexico, the Galaxy seems to be surrounded by a huge disk of Hydrogen gas. This could be a place to examine pristine Hydrogen that hasn't been "polluted" by heavier elements created in stars.